This tutorial is for WordPress developers who want to integrate a GitHub login button into their WordPress themes. eCommerce sites and Forums require you to login, and providing a GitHub login button make the registration and login process faster for users as they don’t have to fill up long forms. Today we will look at the two possible methods for integrating Github Login to WordPress sites. I have created a Github OAuth library for WordPress which handles all the tough task of Github OAuth login. This library also creates necessary REST API URLs required for Github Login. Extract the zip file in your theme folder. Now you will have a inc directory in your theme folder which has all necessary files for GitHub login. This URL will handle all core functionality of Sign In with GitHub. Once the user has been logged in, the user will be redirected to the homepage of the website. Users who install your theme needs to create a GitHub App for their website. Once they have created a GitHub App they need to copy the Client ID, Client Secret and App name from GitHub App dashboard and store them as WordPress options. Use the following option names to store the option values. This is all you need to do to have a GitHub login button in your theme. Letâ€™s create a GitHub Login widget that displays a GitHub Login Button. Here is the code for creating a Github Login Widget. You can put this code inside a plugin also. Make sure you pack the GitHub OAuth WordPress library with your plugin also. We first included the GitHub OAuth library. Then we created a Widget that displays a Login button on the frontend and displays keys input boxes on backend. When users submit the widget form on the backend the values are saved as WordPress options. When someone clicks on the GitHub Login button on the frontend of the widget, the users are redirected to the Redirect URL as mentioned above. The redirected URL handles all the login task. Github provides different access tokens for different users. GitHub OAuth WordPress library stores the access tokens as user metadata. So make Github REST API calls using this library only if the user is logged in using GitHub. Now you have learned how to create a GitHub Login button. If you integrate it in your theme then you can place it button anywhere. If you integrate it in the plugin then you need to put in a widget. The WordPress Github Plugin is a WordPress plugin that displays the github profile of the provided user profile. One of the best things about GitHub is its issue tracker. You can reference and close issues from commit messages, as well as assign an issue to a particular team member. 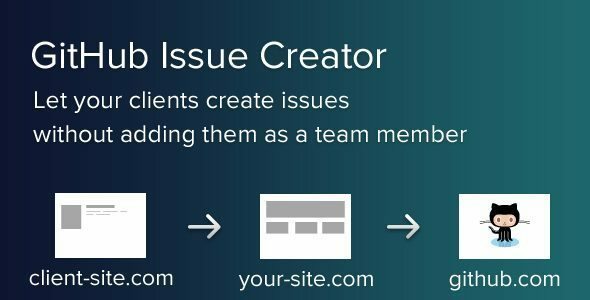 However, as great as the feature is, it’s impossible to let your client create issues for your projects without adding them as a team member. As a result, GitHub Issue Creator was designed to make a bridge between your client’s website and GitHub. You can embed a “new ticket” form on their website that will create an issue on your GitHub repository. Plus, you won’t have to put your GitHub API credentials on their server. Everything is kept on your server. Allows a user to add a widget to show their Github repositories on their site. Based around the main Github site and its API. Plugin displays a list of repositories the user has on the site, as well as the percentage of commits to the project. Use the custom GitHub Commit widget to display a list of the latest updates from a repository. Additionally, you can use shortcodes to add commit lists or embed any gist. The plugin will cache the GitHub response for a certain time period. You can change this value to any WordPress schedules you have isntalled (default: hourly, half-day, daily). To get more time frames you will need an additional plugin that extends the cron schedules. Displays the latest commits of a github repo in the sidebar. The Plugin provides a sidebar widget which can be configured to display commits from a github repo in the sidebar. You can have multiple widgets with different repo configured for each one of them. This plugin doesn’t contain any feature (widget or shortcode) that you can use directly once the plugin is activated. This plugin contains API to help you in making a call to GitHub API resources. There’s includes/tools.php file that show you how to use the API from this plugin to make a call to various GitHub resources (for instance to get repository information). WP Github Gist WordPress Plugin, provides the ability to embed gist and files from Github in your blog posts or pages. Even though Github doesn’t provide a way to embed files, this Plugin still works by using the gist-it service.